Roasted Garlic & Italian Herb: Real wild-caught Alaska Pollock. Real ingredients like roasted garlic , Italian herbs and savory breadcrumbs. Bold seafood flavor has never been easier. Just 160 calories per fillet. Lemon & Cracked Peppercorn: Real wild-caught Alaska Pollock. Real ingredients like lemon, cracked peppercorn and Panko breadcrumbs. Only 150 calories per fillet. Southwest Tortilla: Real wild-caught Alaska Pollock. Real crushed tortilla chips, Tex-Mex spices and a hint of chili. Spice up your next seafood meal with Southwest Tortilla fillets. Only 150 calories per fillet. 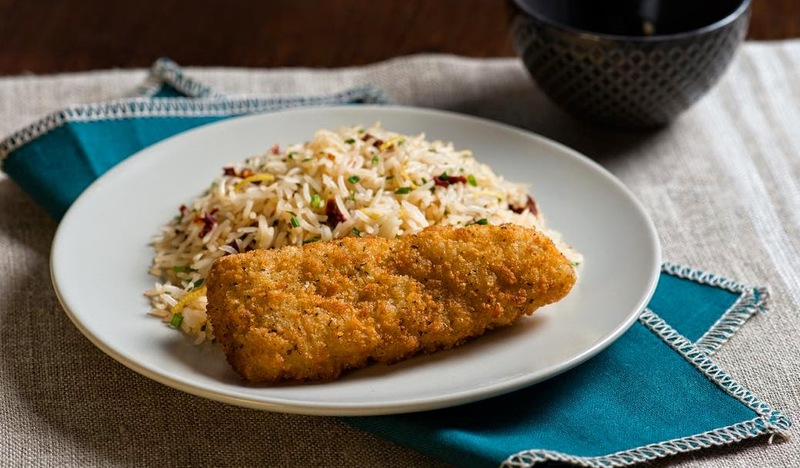 Southern Style: Real wild-caught Alaska Pollock. Real ingredients like Southern spices and a crunchy corn coating. Bold, delicious seafood has never been easier. Just 170 calories per fillet. 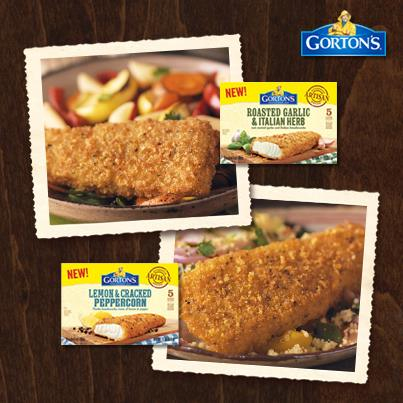 All four varieties of Gorton's Artisan Fillets contain no fillers, MSG, artificial colors or flavors. 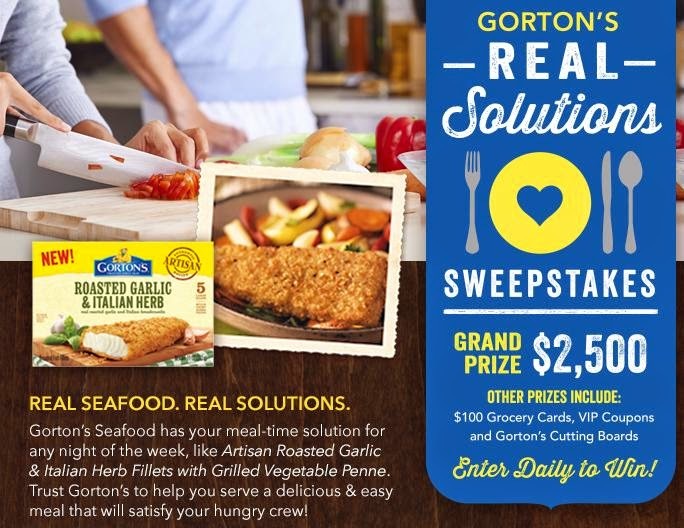 Be sure to enter Gorton’s Real Solutions Sweepstakes! The grand prize is $2,000, and all you need to do is fill out a quick form to enter. Ready to try Gorton’s with your family? Check out Gorton’s Product Locator to find local grocery stores and retailers who carry Gorton’s Seafood, and be sure to follow Gorton’s on all of their social media outlets; Facebook, Instagram, Pinterest, Twitter, and YouTube. This giveaway will end April 22nd at Midnight EST. Disclaimer: The Being Frugal and Making it Work family received a complimentary Gorton's Seafood #RealSolutions free product coupons for the purpose of writing a review and hosting a giveaway. Regardless, I only recommend products or services I would use personally and/or believe will be a good fit for my readers. The views and opinions expressed on this blog are based purely by our own experiences. No monetary compensation was received. Results may vary. I'd like to try the southwest tortilla variety. In 2011, we started our Trusted Catch™ program to better communicate to you everything that we do. I'd love to try the garlic grilled shrimp the most. The roasted garlic and italian herb ones look really good! i like that they are branching out and creating new flavors. I think the Roasted Garlic and Italian Herb sounds really good! I have the Beer Batter fish in the freezer right now, and I can't wait to try that, either! Simply Bake Salmon. I love Salmon but don't make it too often. i want to try their grilled tilapia fillets. A healthy dinner yet easy to make! my favorite fish recipe is salmon with lemon and capers. It is sooo good with orzo and sugar snap peas. yum! I love crab cakes! That's probably my favorite seafood recipe. I don't like a lot of seafood. I love shirmps they are my birthmark i can eat them all day. Stuffed shrimp with crabmeat, and sliced tomoto, onion salad on the side is my favorite. I want to try the grilled talapia. We already love their grilled salmon and pair it up with some wild rice. I would like to try the crunchy breaded fish fillets. I like my seafood crunchy not soggy so this souunds like something I would like to try. I love their shrimp scampi and my kiddos love the fish sticks. gortons is a family favorite so I can't wait to try this line. I love making salmon with just a touch of lemon and butter on t. It's super yummy and has become a family favorite. i also really enjoy fish sandwiches. My favorite fish meal is grilled salmon. I love that it doesn't taste too fishy! I'd love to try their Southwest Tortilla Artisan Fillets!